Reactive oxygen species are side products of biochemical reactions, mainly in electron transfer chain reactions in mitochondria. Their excess in the body can damage vital macromolecules including proteins, lipids, and DNA, resulting in oxidative stress. Oxidative stress means that there are more oxidants than antioxidants., It can lead to cardiovascular diseases , and cancer. Epidemiological studies have shown that if more antioxidants, especially phenolic compounds, are consumed, there will be decreased mortality because of cardiovascular diseases. Hence, food industry has used synthetic antioxidants as food additives to extend shelf life and inhibit lipid rancidity., However, demand for natural antioxidants has increased due to concerns about synthetic antioxidants' safety.,, Therefore, there has been increasing efforts to identify new antioxidants from natural resources. These natural antioxidants can design nutraceuticals that prevent oxidative damages in the body. Ferula gummosa Boiss. plant, locally called Barijeh in western and northern mountains of Iran (contemporary Persia), is a member of genus Ferula belonging to the Apiaceae family. It grows in spring on 1900–3200 m altitude above the sea level. “Barijeh” is the name given to this plant by Iran's nomads. Its resin has conventionally been used for treating diarrhea. The nomads believe that it is an effective antidiarrheal herbal medicine. In traditional Persian medicine, the aerial parts' gum of this plant has been used for stomach pain, chorea, epilepsy and wound healing. There are some reports regarding the medicinal effects of F. gummosa Boiss. For example, it has been shown that the hydroalcoholic extract of the aerial parts of the plant has antinociceptive activity. This curative effect has also been reported for seed and root acetone extract of the plant. Furthermore, a methanol-chloroform (1:1) extract of this plant and its fractions has alleviated the morphine withdrawal syndrome induced by naloxone. Moreover, the anticonvulsant potential of an essential oil, the antibacterial activity of its seed, and the anti-inflammatory activity of its seed and root  have been reported. In this study, three assay methods were used to measure the antioxidant contents of the flower and leaf extracts of F. gummosa Boiss. plant: ferric-reducing antioxidant power (FRAP), 2,2-diphenyl-1-picrylhydrazyl (DPPH), and oxygen radical absorbance capacity (ORAC) assays. In addition, Folin–Ciocalteu (FC) reagent was used to determine the total phenolic content (TPC) of the extracts. Based on the reaction mechanism, FRAP, DPPH, and FC assays are categorized as electron-transfer methods and ORAC assay as a hydrogen-transfer method. F. gummosa Boiss. was collected from Damavand Mountains in the north of Iran and identified by Dr. Seyed Mohammad Masoumi, Assistance Professor of Botany, Razi University, Kermanshah, Iran. A voucher herbarium specimen (No. 576) was deposited in the Herbarium of Biology Department Razi University. The chemicals 2,2'-azobis (2-amidinopropane), dihydrochloride (AAPH) and 6-hydroxy-2, 5, 7, 8 -tetramethylchroman-2-carboxylic acid (Trolox) were purchased from Sigma-Aldrich GmbH (Munich, Germany). 2, 4, 6-tripyridyl-s-triazine (TPTZ), fluorescein, 2,2-diphenyl-1-picrylhydrazyl (DPPH), iron (III) chloride hexahydrate (FeCl3.6H2O), sodium tungstate, sodium molybdate, sodium carbonate (Na2 CO3), sodium acetate, sodium sulfate, and all of the used solvents were purchased from Merck (Darmstadt, Germany). All solvents and reagents were of analytical grade. Aerial parts of F. gummosa Boiss. plant were dried at room temperature 20°C–25°C and darkness for 7 days. The dried flowers and leaves were grounded in a blender. About 50 g of the grounded powders was placed separately in two round bottom bottles. They were mixed with petroleum ether (each three times) until discoloration. Afterward, the two almost resin-free suspensions were centrifuged at 2700 g for 10 min. The obtained pellets were remixed with 500 mL ethanol and stirred for 4 days. After centrifugation at 2700 g for 15 min, the supernatants were evaporated under vacuum to dry out. The resultant powders were flower or leaf ethanol extracts. They were stored at 4°C until analysis. Subsequently, flower or leaf ethanol extract powders were re-dissolved in methanol (50%):chloroform (1:1 v/v) mixtures separately. The methanol phases (flower or leaf methanol extracts) were evaporated under vacuum to dry out. The TPCs in flower's ethanol and methanol extracts and leaf's ethanol and methanol extracts were determined by FC assay , with some modifications. Appropriate extract dilutions (50 μl) were added to FC reagent (50 μl, 0.2 N) and double distilled water (800 μl). After 5 min, Na2 CO3 (100 μl, 0.5 M) was added. The mixtures were incubated for 1 h at room temperature, and the resulting light blue color solution absorbance was measured at 725 nm using a Cary-100 Bio-spectrophotometer (Varian, California, USA). Trolox was used as the standard antioxidant. The standard curve was linear between 0 and 200 μM Trolox. Results were presented as μmol of Trolox equivalent per gram of plant extracts' dry mass (μmolTE/gDM). The FRAP assay was done according to Benzie and Strain's method , with some modifications. The stock solutions included 300 mM acetate buffer, pH 3.6, 10 mM TPTZ solution in 40 mM HCl, and 20 mM FeCl3.6H2O solution. The FRAP solution was prepared by mixing 25 mL acetate buffer, 2.5 mL TPTZ solution, and 2.5 mL FeCl3.6H2O solution. It was warmed up to 37°C before use. Flower ethanol and methanol extracts and leaf ethanol and methanol extracts (10 μl) were allowed to react with 990 μl of the FRAP solution for 30 min in the dark condition. The colored products were read at 595 nm using a Cary-100 Bio-spectrophotometer. Trolox was used as a standard antioxidant to express the extracts' ferric ion-reducing power. The standard curve was linear between 5 and 20 μM Trolox. Results were expressed in μmolTE/gDM. The DPPH assay was done in kinetic and nonkinetic modes according to Miliauskas et al. and Bran-Williams et al. methods with some modifications. In nonkinetic mode, 50 μL of all extracts was mixed with 950 μL of the DPPH solution (6 × 10−5 M DPPH in methanol) for 24 h in the dark. 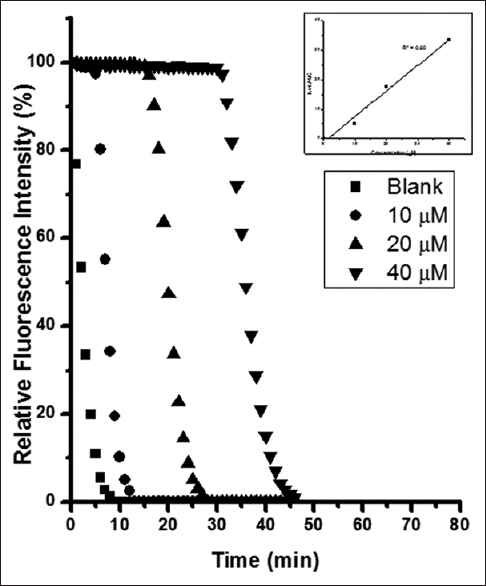 The bleached products' absorbance was then recorded at 515 nm using a Cary-100 Bio-spectrophotometer. Trolox was used as a standard antioxidant to express extracts' antiradical power. The standard curve was linear between 5 and 50 μM Trolox. Results were expressed in μmolTE/gDM. where a is the slope and y0 is the intercept. where CTrolox is molarity of Trolox. Final results were expressed in μmol of Trolox equivalent per gram of dry mass of the extracts (μmolTE/gDM). In our study, a blue-colored solution was produced when the aerial parts extracts reacted with FC reagent and Na2 CO3. This shows the presence of phenolic compounds in all the extracts. The TPC values of the ethanolic and methanolic extracts from the flower and leaf of F. gummosa Boiss. have been tabulated in [Table 1]. The TPC values ranged from 0.4 to 0.9 μmolTE/gDM. The highest phenolic content was obtained using methanolic extraction method. Thus, protocols using methanol (50%):chloroform mixture would be the preferred method to concentrate phenolic substances of high polarity. Table 1: Antioxidant activity of different extracts from Ferula gummosa Boiss. Ferric ion-reducing capacities of the F. gummosa Boiss. extracts are listed in [Table 1]. The trend of the reducing power was similar to that of the TPC measured by FC assay. Again, the leaf methanolic extract with FRAP value of 120 μmolTE/gDM had the highest reducing activity followed by leaf ethanol extract, flower methanol extract, and flower ethanol extract. Compared with vegetables such as Quercus robur (15.92 ± 0.17), Cinnamomum zeylanicum (6.48 ± 0.15), Eugenia caryophyllus clovis (7 ± 0.13), Styrax benzoin (3.08 ± 0.07), Eucalyptus globulus (4.66 ± 0.06), Matricaria recutita (0.12 ± 0.01), Emex spinosus (2.21 ± 0.001), and Asphodelus tenuifolius (0.44 ± 0.002), F. gummosa Boiss. extract has a significantly more ferric reducing potential. However, the solvents used to extract antioxidant compounds in the studies by Dudonne et al. and Al-Laitif et al. were different from ours. The DPPH assay is a technically simple and reproducible method for evaluating radical scavenging capacities of plant extracts, fruits, olive oil, and wines. It has kinetic and nonkinetic modes. Depending on reacting rate to the steady state, there are three types of kinetic reactions: rapid (<1 min), intermediate (5–30 min), and slow (>1 h). DPPH radical scavenging activities of the flower's or leaf's ethanol extracts and the flower's and leaf's methanol extracts were in the range of 105–202 μmolTE/gDMs [Table 1] when calculated nonkinetically. Compared with vegetables such as Aizoon canariense (66.56 ± 2) and A. tenuifolius (20.93 ± 0.09) F. gummosa Boiss. extract has a significantly more radical scavenging capacity. Interestingly, similar trends were observed in FRAP, DPPH, and TPC values (that is leaf methanol extract > leaf ethanol extract > flower methanol extract > flower ethanol extract). To evaluate antiradical behaviors of flower and leaf's methanol extracts kinetically, the time evolutions of remaining DPPH for each concentration of the extracts were plotted [Figure 1]. Antioxidant compounds available in the flower and leaf's methanol extracts had slow kinetic behaviors in our study. Furthermore, the free radical scavenging activities of flower and leaf methanol extracts represented by EC50 were 0.21 and 0.25 mg/mL, respectively. These values were in the range of EC50 of known antioxidants such as curcumin, butylated hydroxytoluene, thymol, and carvacrol, having EC50 values of 0.0078, 0.02, 0.16, and 0.25 mg/ml, respectively. As it is clear, the mechanism of electron-transfer methods such as FRAP, DPPH, and FC assay (which are based on the reduction of persistent radicals or of inorganic oxidizing species) is different from hydrogen-transfer methods such as ORAC (which is based on the competitive bleaching of a probe). Hence, we were convinced that why the results of the first three methods showed close relationship, and there was weak correlation with ORAC assay which is a hydrogen-transfer method. It has been reported that Ferula is a genus rich in coumarins, particularly sesquiterpene coumarins, and our results also confirmed that F. gummosa Boiss. has a high phenolic content. Therefore, F. gummosa is a promising source that shows the high potency of omitting different kinds of free radicals. However, more investigations are required to analyze phenolic contents of the solvent-based extracts of F. gummosa precisely. It should be noted that to use of plant extracts in food industry, cytotoxicity of the extracts must be evaluated scrupulosity. In previous studies, several authors mentioned about cytotoxicity of different parts of F. gummosa Boiss., which we would rely on their result. For example, as a preliminary work, Gharaei et al. have shown that the ethanolic extracts of flower and leaf of F. gummosa Boiss. 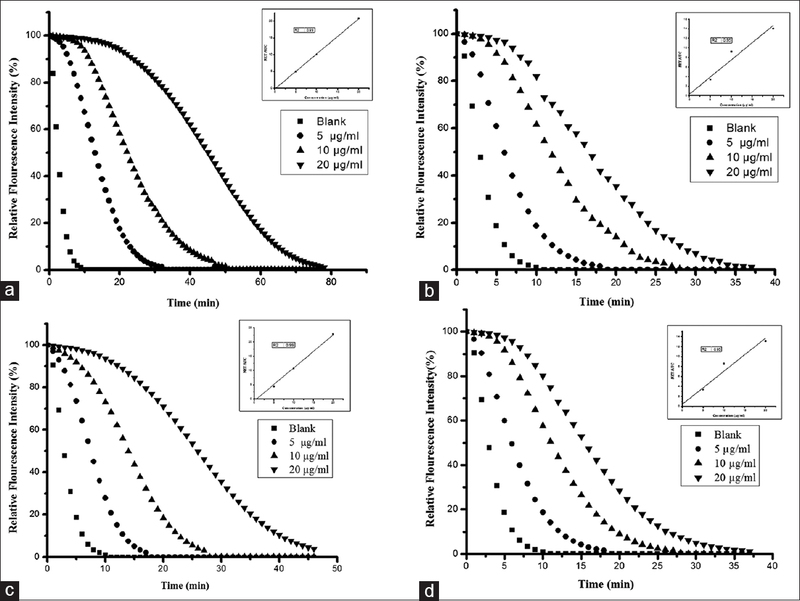 have cytotoxic effects on AGS cell line at concentrations of 50 and 60 μg/mL. However, use of the solvent-based extracts of F. gummosa Boiss. as food additive requires more experimental studies to be done in future. The antioxidant activity of the aerial parts of F. gummosa Boiss. was measured by FC, FRAP, DPPH, and ORAC assays. The first three methods had a high correlation in measuring antioxidant activity. Our study depicts that the alcoholic and hydroalcoholic extracts of aerial parts of F. gummosa Boiss. have remarkable antioxidant activity that may be as a result of their high phenol contents. The high antioxidant activity of the F. gummosa Boiss. could bring up the hydroalcoholic extracts of this plant as a therapeutic agent to prevent and treat diseases due to free radical imbalance in the body, such as Alzheimer and cancer. It is very promising to characterize the active compounds within these plant extracts that may be useful to introduce new nutraceutical agents and also focuses on identifying the mechanism of these activities. We are grateful to Dr. Seyed Mohammad Masoumi, Assistant Professor of Botany at Razi University, Kermanshah, Iran, for authenticating F. gummosa Boiss. We would like to thank Seyed Muhammed Hussein Mousavinasab for his sincere cooperation in editing this text. This study was funded by Razi University of Kermanshah, Iran. Kirkinezos IG, Moraes CT. Reactive oxygen species and mitochondrial diseases. Semin Cell Dev Biol 2001;12:449-57. Ghasemzadeh A, Jaafar HZ, Rahmat A. Antioxidant activities, total phenolics and flavonoids content in two varieties of malaysia young ginger (Zingiber officinale roscoe). Molecules 2010;15:4324-33. Sies H. Oxidative stress: Oxidants and antioxidants. Exp Physiol 1997;82:291-5. Lampe JW. Health effects of vegetables and fruit: Assessing mechanisms of action in human experimental studies. Am J Clin Nutr 1999;70:475S-490S. Ness AR, Powles JW. Fruit and vegetables, and cardiovascular disease: A review. Int J Epidemiol 1997;26:1-3. Steinmetz KA, Potter JD. Vegetables, fruit, and cancer prevention: A review. J Am Diet Assoc 1996;96:1027-39. Serdula MK, Byers T, Mokdad AH, Simoes E, Mendlein JM, Coates RJ, et al. The association between fruit and vegetable intake and chronic disease risk factors. Epidemiology 1996;7:161-5. Adegoke G, Vijay Kumar M, Gopala Krishna A, Varadaraj M, Sambaiah K, Lokesh B. Antioxidants and lipid oxidation in foods: A critical appraisal. J Food Sci Technol 1998;35:283-98. Wu N, Fu K, Fu YJ, Zu YG, Chang FR, Chen YH, et al. Antioxidant activities of extracts and main components of pigeonpea [Cajanus cajan (L.) millsp.] leaves. Molecules 2009;14:1032-43. Iverson F.In vivo studies on butylated hydroxyanisole. Food Chem Toxicol 1999;37:993-7. Williams GM, Iatropoulos MJ, Whysner J. Safety assessment of butylated hydroxyanisole and butylated hydroxytoluene as antioxidant food additives. Food Chem Toxicol 1999;37:1027-38. Aqil F, Ahmad I, Mehmood Z. Antioxidant and free radical scavenging properties of twelve traditionally used Indian medicinal plants. Turk J Biol 2006;30:177-83. Javidnia K, Miri R, Edraki N, Khoshneviszadeh M, Javidnia A. Constituents of the volatile oil of Ferulago angulata (Schlecht.) Boiss. from Iran. J Essential Oil Res 2006;18:548-50. Sadraei H, Asghari GR, Hajhashemi V, Kolagar A, Ebrahimi M. Spasmolytic activity of essential oil and various extracts of Ferula gummosa boiss. On ileum contractions. Phytomedicine 2001;8:370-6. Sayyah M, Mandgary A, Kamalinejad M. Evaluation of the anticonvulsant activity of the seed acetone extract of Ferula gummosa boiss. against seizures induced by pentylenetetrazole and electroconvulsive shock in mice. J Ethnopharmacol 2002;82:105-9. Fazli BB, Parsaei H, Heydar ZG, Shoshtari A. Evaluation of antinociceptive and antimicrobial activities of galbanum plant (Ferula gummosa). DARU 1997;7:1-22. Mandegary A, Sayyah M, Heidari MR. Antinociceptive and anti-inflammatory activity of the seed and root extracts of Ferula gummosa Boiss in mice and rats. DARU J Pharm Sci 2004;12:58-62. Ramezani M, Hosseinzadeh H, Mojtahedi K. Effects of Ferula gummosa boiss. Fractions on morphine dependence in mice. J Ethnopharmacol 2001;77:71-5. Sayyah M, Kamalinejad M, Bahrami Hidage R, Rustaiyan A. Antiepileptic potential and composition of the fruit essential oil of Ferula gummosa boiss. Iran Biomed J 2001;5:69-72. Eftekhar F, Yousefzadi M, Borhani K. Antibacterial activity of the essential oil from Ferula gummosa seed. Fitoterapia 2004;75:758-9. Phipps SM, Sharaf MH, Butterweck V, editors. Assessing antioxidant activity in botanicals and other dietary supplements. Pharmacopeial Forum 2007;33:810-14. Folin O, Ciocalteu V. On tyrosine and tryptophane determinations in proteins. J Biol Chem 1927;73:627-50. Singleton VL, Orthofer R, Lamuela-Raventós RM. Analysis of total phenols and other oxidation substrates and antioxidants by means of folin-ciocalteu reagent. Methods Enzymol 1999;299:152-78. Wojdyło A, Oszmiański J, Czemerys R. Antioxidant activity and phenolic compounds in 32 selected herbs. Food Chem 2007;105:940-9. Miliauskas G, Venskutonis P, Van Beek T. Screening of radical scavenging activity of some medicinal and aromatic plant extracts. Food Chem 2004;85:231-7. Bran-Williams W, Cuvelier M, Berset C. Use of a free radical method to evaluate antioxidant activity. LWT Food Sci Technol 1995;28:25-30. Ou B, Hampsch-Woodill M, Prior RL. Development and validation of an improved oxygen radical absorbance capacity assay using fluorescein as the fluorescent probe. J Agric Food Chem 2001;49:4619-26.
da Silva JK, Cazarin CB, Colomeu TC, Batista ÂG, Meletti LM, Paschoal JA, et al. Antioxidant activity of aqueous extract of passion fruit (Passiflora edulis) leaves: In vitro and in vivo study. Food Res Int 2013;53:882-90. Dudonné S, Vitrac X, Coutière P, Woillez M, Mérillon JM. Comparative study of antioxidant properties and total phenolic content of 30 plant extracts of industrial interest using DPPH, ABTS, FRAP, SOD, and ORAC assays. J Agric Food Chem 2009;57:1768-74. Al-Laith AA, Alkhuzai J, Freije A. Assessment of antioxidant activities of three wild medicinal plants from Bahrain. Arabian J Chem 2015; DOI: 10.1016/j.arabjc.2015.03.004. Huang D, Ou B, Prior RL. The chemistry behind antioxidant capacity assays. J Agric Food Chem 2005;53:1841-56. Cao G, Alessio HM, Cutler RG. Oxygen-radical absorbance capacity assay for antioxidants. Free Radic Biol Med 1993;14:303-11. Atala E, Vásquez L, Speisky H, Lissi E, López-Alarcón C. Ascorbic acid contribution to ORAC values in berry extracts: An evaluation by the ORAC-pyrogallol red methodology. Food Chem 2009;113:331-5. Anagnostopoulou MA, Kefalas P, Papageorgiou VP, Assimopoulou AN, Boskou D. Radical scavenging activity of various extracts and fractions of sweet orange peel (Citrus sinensis). Food Chem 2006;94:19-25. Ghasemi K, Ghasemi Y, Ebrahimzadeh MA. Antioxidant activity, phenol and flavonoid contents of 13 citrus species peels and tissues. Pak J Pharm Sci 2009;22:277-81. Wong SP, Leong LP, Koh JH. Antioxidant activities of aqueous extracts of selected plants. Food Chem 2006;99:775-83. Silva MM, Santos MR, Caroço G, Rocha R, Justino G, Mira L. Structure-antioxidant activity relationships of flavonoids: A re-examination. Free Radical Res 2002;36:1219-27. Amorati R, Valgimigli L. Advantages and limitations of common testing methods for antioxidants. Free Radical Res 2015;49:633-49. Iranshahy M, Iranshahy M. Traditional uses, phytochemistry and pharmacology of asafoetida (Ferula assa-foetida oleo-gum-resin) – A review. J Ethnopharmacol 2011;134:1-10. Gharaei R, Akrami H, Heidari S, Asadi MH, Jalili A. The suppression effect of Ferula gummosa Boiss. extracts on cell proliferation through apoptosis induction in gastric cancer cell line. Eur J Integr Med 2013;5:241-7.